Good news for you is that this week's THN Deals brings Ethical Hacking A to Z Bundle that let you get started regardless of your experience level. 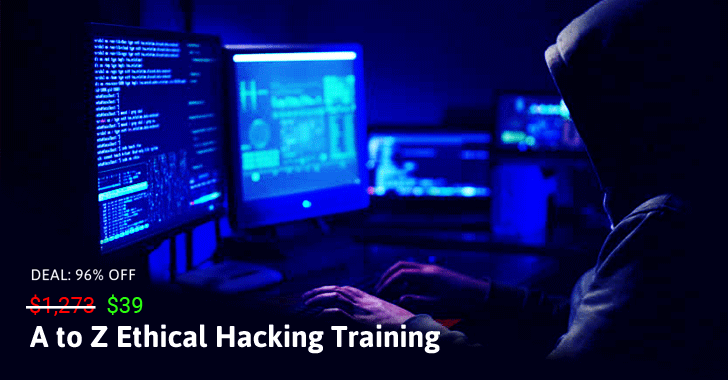 The Ethical Hacking A to Z Bundle will walk you through the very basic skills you need to start your journey towards becoming a professional ethical hacker. The 45 hours of course that includes total 384 in-depth lectures, usually cost $1,273, but you can exclusively get this 8-in-1 online training course for just $39 (after 96% discount) at the THN Deals Store. This course will teach you all about passive and active reconnaissance, scanning and enumeration, social engineering basics, network mapping, and with live hacking demonstrations using tools like Maltego, FOCA, Harvester, Recon-ng, Nmap, and masscan. By the end of this course, you'll be able to think like a hacker and be fully prepared for the Ethical Hacking Certification exams. This course will talk you through basics to advanced hacking techniques, leaving no stone unturned. As its name suggests, A to Z Ethical Hacking Course will give you hands-on practice in a variety of hacking techniques, such as SQL injections, phishing, cross-site scripting, and email hacking, making you learn how to use tools like Metasploit, Keylogger, and WireShark. By the end of this course, you will be ready to get a high-paying ethical hacking job. This course will teach you how to use Burp Suite – a Java-based software platform of tools for performing security testing of web applications – and how to use Burp to automate certain attacks. Burp gives you full control, allowing you to combine advanced manual techniques with state-of-the-art automation, to make your work faster, more efficient, and more fun. With this course, you will learn about different types of web attacks by targeting a test environment based on OWASP Web Goat, a deliberately vulnerable web app used to practice security techniques. This online course will help you discover the art of Penetration Testing and Ethical Hacking. This course will take you through a complete, simulated penetration testing process – Information Gathering, Enumeration, Vulnerability Scanning, Exploitation, and Post Exploitation. By the end of this course, you'll be able to efficiently find and exploit security vulnerabilities in applications or web services manually or using automated scanning tools. As its name suggests, this course will provide you a quick introduction to ethical hacking and how to succeed in the cutthroat IT industry. Since the demand for security professionals is hitting an all-time high, it's a must for you to have a comprehensive knowledge of security hacking and this course will help you jump in on the action. Besides updated Penetration Testing techniques, this 5 hours of immersive course will get you through all up to date ethical hacking tools and techniques. In this course, you'll learn everything a pen-tester does, from exploring attacks on computers, networks, and web applications, to discovering DARKNET and wireless attacks. This course offers you much-needed knowledge about Kali Linux – one of the popular operating systems of hackers that come with over 300 tools for penetration testing, forensics, hacking and reverse engineering – and its hacking capabilities. Since most of your critical data is stored on your smartphone, cyber criminals take a high interest in targeting smartphones to steal your personal information, especially Android, which is the world's largest mobile operating system. Besides Kali Linux, this course teaches you how to hack Android smartphones and tablets and explore countermeasures to each kind of attack to secure them from hackers. By the end of this course, you'll be able to efficiently use valuable mobile hacking tools like Netcat, Ettercap, and NMAP; set up Virtual Machines, a workspace, and an Android platform; and work with the exploit, Metasploit, and Armitage. Last but not the least: This exciting course will help you prevent a variety of common attacks using your Android devices. Basically, it's a penetration testing with Android. This course will help you install NetHunter and Kali Linux on your Android device to perform penetration testing, use your Android device to gain access to any account accessed by devices in your network, create a fake access point in a network and spy on all the data sent on it, explore several exploitation methods to gain full control over a target computer, and discover methods to detect ARP Poisoning Attacks. In short, this online course delves into using Android as a penetration testing tool, using real life scenarios that will give you full control over a variety of computer systems. By course's end, you'll learn how attacks work, how to launch the attack practically, and how to detect and prevent that type of attack from happening. All these impressive courses come in a single bundle Ethical Hacking A to Z Bundle that costs you just $39 (after 96% discount) at the THN Deals Store.